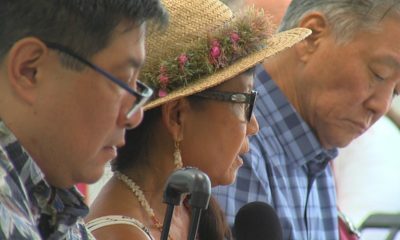 PUNA: Today marks the one year anniversary of the raising of the USGS Volcano Alert Level for Kīlauea Volcano from WATCH to WARNING, as the June 27 lava flow was deemed an imminent threat to residents in Puna. PUNA, Hawaii – Today marks the one year anniversary of the raising of the USGS Volcano Alert Level for Kīlauea Volcano from WATCH to WARNING, as the June 27 lava flow was deemed an imminent threat to residents in Puna. The alert has since been downgraded back to a Watch, and the activity continues upslope, all within 5 miles of the Puʻu ʻŌʻō crater on the East Rift Zone. Video taken yesterday by Mick Kalber aboard Paradise Helicopters (above) is a good example of how things currently look over the June 27 lava flow on a week to week basis. As the name suggests, the June 27 lava flow had been on its way downslope for months before its path became of serious concern to Hawaii Island’s populated areas in and around Pahoa. 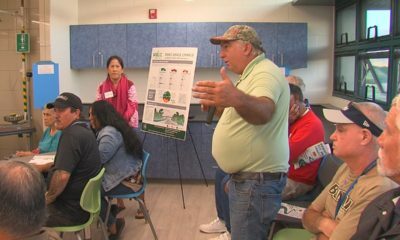 The warning began a season of deep concern that lower Puna would be cut off from the rest of the island should the flow burn its way over Highway 130. Aside from the loss of one home, a swath of agricultural land, and minor infrastructure, the greater disaster never materialized. The lava flow stopped short of crossing the highway and changes in the flow behavior upslope ended the warning in March 2015. The whole affair is the subject of this week’s USGS Hawaiian Volcano Observatory Volcano Watch article, available below. SEPTEMBER 5, 2015 – As the June 27 lava flow became a growing concern for Puna, the Hawaii County Civil Defense began the practice of issuing daily (sometimes three per day) eruption information updates, which Big Island Video News incorporated into segments using various video sources. 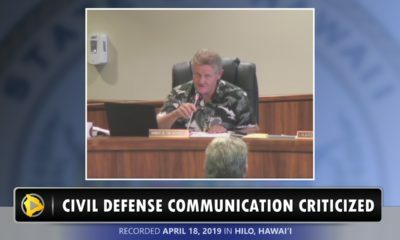 The video above features the civil defense update that immediately followed the USGS Volcano Alert upgrade to a Warning level. 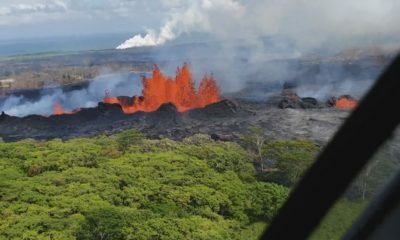 From September 4, 2014, to March 25, 2015, USGS Hawaiian Volcano Observatory scientists raised the Volcano Alert Level for Kīlauea from WATCH to WARNING as the June 27th lava flow advanced toward Pāhoa and posed an imminent hazard and threat to nearby communities and infrastructure. 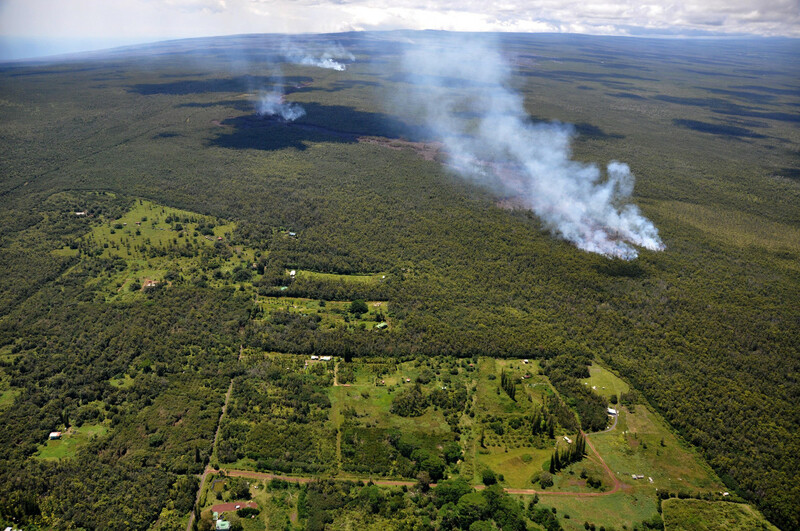 Shown here on September 12, the leading edge of the lava flow (marked by dense smoke, middle right) burned through thick forest less than 200 m (220 yds) from the boundary of Kahoe Homesteads (lower left). USGS photo. 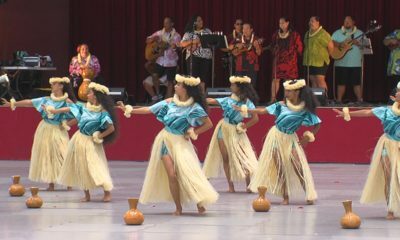 Volcano Watch is a weekly article and activity update written by scientists at the U.S. Geological Survey`s Hawaiian Volcano Observatory. This week marks the one-year anniversary of when the June 27th lava flow, named for the date in 2014 that it began erupting from Puʻu ʻŌʻō on Kīlauea Volcano’s East Rift Zone, was considered by USGS Hawaiian Volcano Observatory (HVO) scientists to be an imminent threat to Kaohe Homesteads residents in the Puna District of the Island of Hawai‘i. On September 4, 2014, HVO increased the USGS Volcano Alert Level for Kīlauea Volcano from WATCH to WARNING as the flow advanced to within 1.2 km (0.7 mi) of the Kaohe Homesteads boundary. Since early July, the lava flow had been advancing an average of 250 m (820 ft) per day. When the WARNING notification was issued, lava was just emerging from the third set of ground cracks that the flow had poured into along the East Rift Zone about 13 km (8 mi) from Puʻu ʻŌʻō. 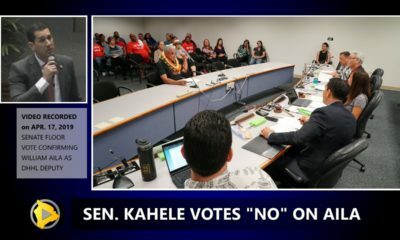 At the average rate of advance, HVO scientists projected that the lava flow could reach the Kaohe Homesteads within 5–7 days, if it stayed within the rift zone’s ground crack system. Instead, lava escaped the cracks and flowed along a northerly path on the west and north boundaries of Kaohe Homesteads. The flow eventually advanced in fits and starts another 8 km (5 mi) into the middle of Pāhoa town by late October 2014, and then to the outskirts of Pāhoa Marketplace in late December 2014 through March 2015. During this time, the flow fronts were only a few hundred meters (yards) from homes, businesses, and power and communication lines, so HVO kept the Volcano Alert Level for Kīlauea at WARNING. A series of breakouts from the lava-tube system near Puʻu ʻŌʻō in early 2015 spawned many surface flows far upslope of Pāhoa, which eventually helped to break down the tube system only 6 km (4 mi) from the vent. With no lava moving through the lower part of the tube, surface flows near Pāhoa Marketplace became completely inactive by March 13. With the active parts of the June 27th lava flow far from inhabited areas and moving very slowly, they were no longer considered to be an immediate threat to people and property. So, HVO decreased the USGS Volcano Alert Level to WATCH on March 25, 2015, where it remains today. The volcano WATCH and WARNING alert levels might sound a lot like notices issued by the National Weather Service for hazardous meteorological events, including the parade of tropical storms and hurricanes that have approached Hawaii this summer. That’s because the USGS adopted these familiar terms to create a similar standardized notification system for volcanic activity in the United States. A full description of the USGS Volcanic Activity Alert-Notification System is provided in a USGS Fact Sheet, available online at http://pubs.usgs.gov/fs/2006/3139/fs2006-3139.pdf. This notification system was formalized in 2006 to include Volcano Alert Levels that inform people on the ground about a volcano’s status—NORMAL, AVISORY, WATCH, and WARNING. For Kīlauea, the current WATCH level means that an eruption is occurring, but poses limited hazards to people and infrastructure on the ground. For a volcano that is not erupting, it means that the volcano is showing elevated signs of unrest with the potential of eruption increased, but not certain. The notification system also includes an Aviation Color Code to inform the aviation industry (especially flying aircraft) about a volcano’s activity, with a particular focus on volcanic ash—GREEN, YELLOW, ORANGE, and RED. Kīlauea’s color code today is ORANGE, which means an eruption is underway with no, or minor, volcanic-ash emissions. Thus far, the color code has not changed from ORANGE during the June 27th lava flow activity. USGS volcano notifications are issued by all five U.S. volcano observatories, including HVO, based on analyses of data from monitoring networks, direct observations, and satellite-based sensors. You can receive all or some of these notifications via email by subscribing to the USGS Volcano Notification Service at http://volcanoes.usgs.gov/vns/. We encourage island residents to sign up for this free service and to stay informed about the status of Hawaiian volcanoes!